After trying to brine pork chops, I have decided that I would never make pork chops again without brining them first. It is the most bullet proof way of cooking pork chops, and not overcooking them and drying them out. The brine injects so much moisture and flavour. I also did the most simple brine possible. 1. In a pot, heat 2-3 cups of water. Basically enough that you could full submerge the pork chops in. Put in 1/2-1 cup of salt. Don't skimp on the salt. It may seem like a lot, but you want the brine to tasty pretty salty. The salt it what will open up the cells of the pork chop and inject the flavour and moisture. Put in a handful of whole peppercorns into the water, as well as a bay leaf. 2. Let the brine cool over many hours. Or you could put it in the fridge to speed up the process. Once the brine has cooled and is room temperature, you can submerge the pork chops. Ideally you could brine them over night, or for a full day. But I assume you'd want to do it for at least 4-6 hours, but I'd recommend over night. 3. The next day, you can grill the pork chops on the grill. Or fry them in a pan. Or do like me and use a grill pan. Maybe 6 minutes each side. 4. 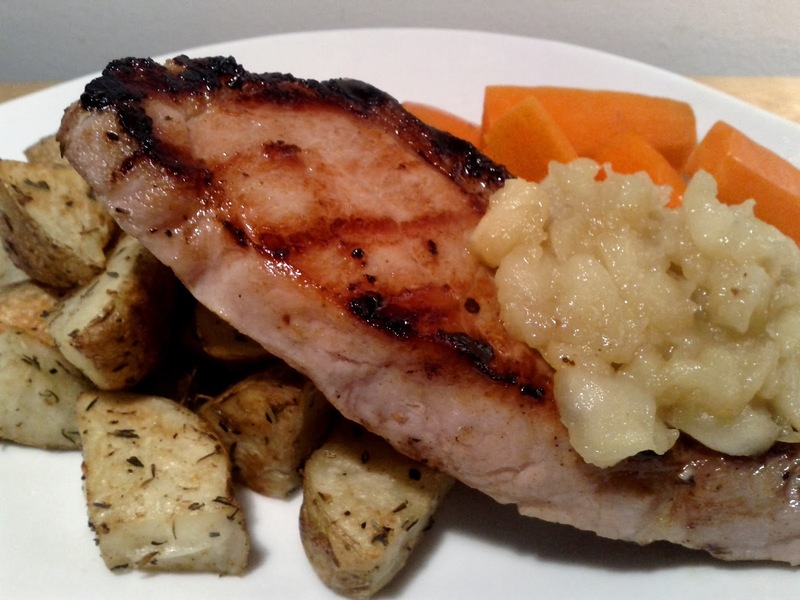 These brined pork chops as a tad salty because of the brine, so it's great to pair it with something sweet like apple sauce. I just chopped up some apples into cubes, and put them in a pan. Added a little brown sugar, white wine vinegar. But you could also just use some apple sauce from a jar if you want. 5. For the carrots, I just tossed some cooked carrots in some honey and butter. And for the potatoes, I cubed them and tossed them in oil, salt, pepper, and some herbs. And then put them in the oven for 20 minutes at 400 degrees.